Protected from the ocean by barrier islands and surrounded by rivers and creeks that flow among more than 60 sea islands, Beaufort occupies the high spot on a lowcountry peninsula. Situated midway between the port cities of Charleston, South Carolina, and Savannah, Georgia, its large, deep harbor drew 16th and 17th century European explorers. Early attempts made by the Spanish and the French to settle the region failed. By the 1660s, British explorers had discovered the appeal of the area referred to as Port Royal. Accounts of the coast ’s economic potential led several British colonists to obtain land with the intention of establishing trade with the Native Americans and pursuing agricultural opportunities. Their successful settlement on the islands of Port Royal in the late 1690s and early 1700s laid the groundwork for the founding of Beaufort. A charter approved in January 1711 by the colonial proprietors of Carolina, authorized the establishment of the new port town of Beaufort, named for Henry Somerset, the Duke of Beaufort. The import/export opportunities associated with a new port promised benefits to the residents, British merchants, the colony, and the mother country. Charles Towne, to the north, welcomed the founding of the town as well. Beaufort would become the first town in the line of defense against incursions by the Spanish from Florida. The first documentation of a Jew in Beaufort dates to the 1760s. It is reasonable, however, to assume that Jews arrived even earlier. A small Jewish community remains in Beaufort today. Sephardic and Ashkenazic Jews were living in Charleston as early as the 1690s. By 1715, the presence of a kosher beef shipping company not only implies the existence of Jews in Charleston, but in nearby towns, such as Beaufort, as well. Peter Lavien moved from Danish Saint Croix to South Carolina in 1765. Lavien, half-brother to Alexander Hamilton and son of a Jewish merchant, became a successful merchant in Beaufort. The earliest evidence which places him in Beaufort describes his election to the post of church warden for Saint Helena’s Anglican Church in 1768, a post which involved governmental duties such as collecting taxes, in addition to parish responsibilities. It is unclear whether Lavien was a practicing Anglican despite his Jewish heritage, or if he simply wished to be civically active in his community. Saul Solomons is reported to have immigrated to South Carolina from Germany in the late 1700s. He lived in Saint Peter’s Parish, south of the town of Beaufort, along the Savannah River. His brother, Hart, joined him in Beaufort after living in Charleston initially The two were cotton factors, or agents handling the sale of cotton in Savannah and Beaufort. While Saul married a Protestant, there is evidence that suggests the brothers had ties to Charleston’s synagogue, Kahal Kadosh Beth Elohim. Saul Solomons lived in the Beaufort area for nearly 50 years. Tombstone inscriptions in Mordecai Sheftall Cemetery in Savannah reveal the presence of Jews in Beaufort in the late 18th and early 19th centuries. One man is noted to have died in 1771 “at Port Royal.” Two female members of the prominent Sheftall family of Savannah died within days of each other in Beaufort in 1820. It is believed that the Sheftalls had retreated to Beaufort to evade a contagion afflicting the residents of Savannah. Meyer Jacobs, a Jewish immigrant from England, lived in Beaufort before moving to Charleston in the mid-1830s. It is not known when he arrived in Beaufort, but documents reveal that by 1825 he was an officer in the Beaufort Volunteer Artillery, an organization that included men of prominent local families. Jacobs arrived in South Carolina much sooner however, and he established ties with Charleston's Beth Elohim congregation. His name can be found in the synagogue’s 1811 records, and it appears he maintained ties to Charleston’s Jewish community while living in Beaufort. In the early 1830s, Jacobs held several positions of civic responsibility in Beaufort. He was a warden in 1831, a delegate to the Nullification Convention in 1832, and a state legislator in 1833. He continued to be active politically after moving to Charleston. Moritz Pollitzer, an immigrant from central Europe, moved from New York to Beaufort in 1862. During the Civil War, landowners and businessmen fled the area when Union troops occupied Port Royal Sound. Pollitzer took advantage of the opportunities the Civil War and Reconstruction offered to make a good living. He became a cotton factor and landowner, and earned a positive reputation in the Beaufort community. His descendants shared his ambitious nature and spread the high standing of the Pollitzer name across South Carolina. Notable among them were three Pollitzer women, granddaughters of Moritz, who pursued college educations and were active in the suffrage movement. In 1878, an estimated 29 Jews were living in Beaufort. By 1937, the number had risen to just over 100, nearly a four-fold increase. Beaufort's Eastern European Jews were part of a flood of more than 2.5 million Jewish immigrants into the United States between 1881 and 1924. Beaufort’s latest Jewish immigrants, like their counterparts in other American cities, gained a foothold by starting their own businesses, often grocery or dry goods stores. The phosphate mining industry in Beaufort took off in the 1870s and continued through the 1880s, prompting Jewish immigrants to set up shop both in downtown Beaufort and surrounding towns such as Burton and Dale, catering to the mine workers. Beaufort’s main commercial thoroughfare, Bay Street, supported many Jewish-owned stores in the first half of the 20th century. A shopping trip downtown was as much about visiting the Schein, Lipsitz, Mittle, Rudowitz, Weinberg, and Hirsch families as it was about making purchases. Other Jewish family names in the area included Levin, Richman, Getz, Mark, Cohen, Epstein, Young, Levy, Goldberg, Schoenberg, Lipton, and Farbstein. Not all Beaufort Jews were merchants; their numbers also included a farmer, junk dealer, watch repairman, cobbler, printer, plumber, electrician, and baker. 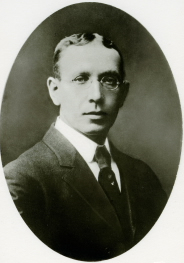 The first Jewish professional in town during this period was attorney William N. Levin. After finding an uncle in Walterboro, William Keyserling settled in Beaufort where, through hard work and determination, he advanced from cotton gin machinist to business partner in the Macdonald, Wilkins Company, a cotton ginnery and wholesale warehouse on St. Helena Island. During this time, he sponsored the immigration of his mother, four brothers, and a niece and nephew to Beaufort, and purchased land in nearby Dale and Coosaw, establishing farms large enough to require the relocation of sea islanders as laborers. 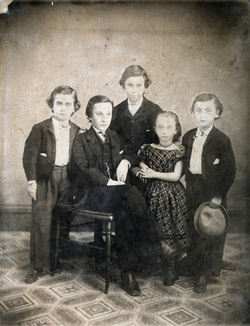 William and his wife, Jennie Hyman, a native New Yorker, raised four children who became successful in their own right. Leon Keyserling, achieving the highest public profile of the siblings, put his Harvard Law degree to work in economic policy-making for New York Senator Robert F. Wagner’s New Deal legislation, as an economic advisor to President Harry Truman, and later as a private consultant in Washington. William and Jennie were actively involved in Beaufort’s civic affairs, as were many of the town's Jews. Jennie was also active in the Beth Israel Sunday School. William, according to his son, was “not a religious man outwardly,” in that he did not attend services at the synagogue, nor did he keep kosher. However, his actions later in life demonstrated his feelings of connectedness to his fellow Jews, in Beaufort and beyond. He actively supported Israel’s statehood and, after he retired, began regularly attending services at Beth Israel as a show of support for a congregation then suffering a decline in membership. 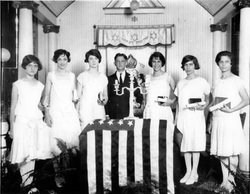 Anti-Semitism was not a significant factor for the vast majority of the first and second generation Jewish-Americans of Beaufort, although most Jews felt somewhat different from their Christian neighbors. Hyman Lipsitz, born in Beaufort in 1913, reports Jews and Christians “got along fine.” Jews formed close friendships with non-Jews. Julian Levin, born in 1921, attended the Methodist church with his friends as part of his social activities. Jewish men were active in local social organizations, such as the Masons, the Chamber of Commerce, and the Yacht Club, which involved more card playing than sailing. Yet Beaufort Jews did face exclusion from the local country club. Herbert Keyserling, a practicing physician in Beaufort, was finally admitted to the country club after his friends intervened on his behalf. Although Jews had been living in the area since the mid-18th century, they did not formally organize a congregation until 1905, when Beth Israel received its charter from the state. 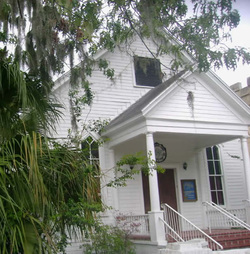 Initially, its Orthodox services were held in the Masonic Hall above a Bay Street store and functions were held in the Beaufort Arsenal. In 1907, Beth Israel had 36 members and met only on the High Holidays. By 1908, the congregants had built a new synagogue, which they dedicated in a formal ceremony. In 1910, the congregation purchased land for a cemetery for $152.50, and two years later established a cemetery so that Beaufort Jews no longer had to be buried in Charleston or Savannah. In the 1930s and early 1940s, congregational meetings were sporadic, but became regular again in 1943. Women’s names and the Ladies Auxiliary begin to appear in the minutes in the mid-1940s, as well as plans to build an annex to house a recreation hall and the cheder. 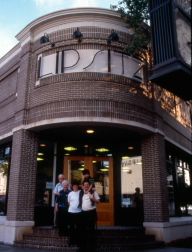 The new center was completed in the early 1950s after the congregation had made the transition from Orthodox to Conservative. The strict Orthodoxy practiced by the immigrants was driving the second generation away. Membership and attendance was declining. Dr. Sol Neidich, whose father Morris was president of the synagogue at the time, proposed in a 1948 meeting that a Conservative rabbi be hired. After some “lively discussions,” the proposal was accepted, and the new Conservative rabbi was installed in 1949. Efforts to increase the participation of adults and children in synagogue life were renewed. A 1949 membership list consists of 44 heads of households, including five women. Baltimore-born Rose Mark raised her children in Beaufort after World War II and recalled the Purim and Hanukkah parties held every year. They kept a kosher kitchen in Beth Israel's new center and held community seders as well. She sensed a feeling of camaraderie among the women of the congregation as they prepared meals together, as if they all belonged to one family. 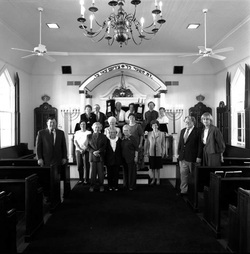 Members of Beth Israel, 2000. Once the third generation had reached adulthood, the size of the Beth Israel family steadily diminished. In 1996, when Mark was interviewed for the College of Charleston's Jewish Heritage Collection, the congregation still had a rabbi, but was struggling to survive. With just 25 member-families, it was difficult to come up with a minyan, even though women were counted. Finances were equally desperate. Mark had been the first female vice president of the congregation, and in 1996 was nominated as its first female president, a post she held for seven years. There are approximately 50 active members at Beth Israel, with 20 to 25 attending Friday night services regularly. The congregation does not have a rabbi at present, but a competent lay leader conducts services. 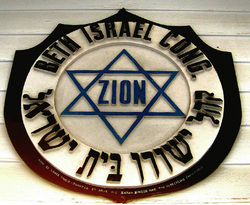 Officially, Beth Israel remains Conservative, but its policies are flexible, fostering an atmosphere of inclusiveness. While the Jewish community of Beaufort has always been small, it has persevered for over two hundred years, long enough to benefit from sunbelt migration.